In "A Corset Family Tree, Abridged," I defined the various common styles of corsets, both historic and modern. Another important ingredient to corset style is the overall silhouette shaping, primarily through the rib cage. It's particularly important when corset shopping to know the silhouette you are targeting so you can identify the corsetieres who cater to that style. Sparklewren "Rose Gold" corset with conical rib. Model: Victoria Dagger. Photo © Sparklewren. Sometimes called "ice cream cone," a conically shaped corset transitions from the bust/underbust to the waist with a smooth straight line. Sparklewren's work often features a classic conical rib. This style is often perceived as the mildest-looking, which is probably why it tends to have the broadest appeal. Ironically, it actually tends to be the most uncomfortable rib shape, unless a) one has narrow and/or compressible ribs, b) one has trained their ribs as part of their waist training, and/or c) the corset is achieving only a mild reduction. A conical corset could also have "conical hips" that flare smoothly out or rounded hips (this is the variation often called ice cream cone), depending on your definition. Dollymop for Dark Garden "Antoinette" corset with classic hourglass shaping. Photo © Joel Aron. An hourglass corset looks very much like the timekeeping device for which it is named. The sides of the ribs and hips are rounded and the waist is well-defined. Dark Garden's ready-to-wear line is a classic hourglass shape. This shape suits a slightly larger reduction and is easier on the ribs for new corset wearers or prolonged wear. Pop Antique "Valentine" corset. The Pop Antique ready-to-wear line features a cupped rib as part of its engineered fit. Model: Victoria Dagger. Photo © John Carey. Similar to an hourglass, a cupped rib takes it one steps farther: the ribs are rounded and have minimal compression at both the side and front of the rib cage. Hourglass corsets generally still compress the front of the rib cage. A cupped rib is one of the signatures of my line, Pop Antique. Those with stiff, non-compressing ribs and costal cartilage or front-protruding ribs will find a cupped rib most comfortable, particularly if they are slim and therefore have little cushioning to protect their ribs. This shape is generally perceived as the most extreme, and it does tend to afford the greatest reduction, but it still leaves the most room for the underlying anatomy. Aesthetically, some find it to be too "squared" looking. A pipestem is definitely an extreme shape, usually only found in custom/bespoke corsets for serious tightlacers/waist trainers. A pipestem waist is a vertically extended waist, realistically usually in the 1-2" range, below what is by necessity a cupped rib shape. Since it is limited to a custom fit, not many brands "specialize" in a pipestem (or stem waist), but tightlacer Spook's 2" pipestem corsets were made by C&S Constructions. The pipestem silhouette seems to predate the popularity of a cupped rib without an elongated waist. Sparklewren "Soft Dove" corset with mild U-Shape. Modeled by Tingyn. Photo © Sparklewren. This mild shape is a less common one, and could be considered either a marker for a cheap corset or the mildest version of a conical rib. A U-Shape corset transitions with smooth lines from the ribs to a shallow curve at the waist and another smooth line down the hip. This style therefore works best with very mild reductions and is usually seen on short-hip styles. 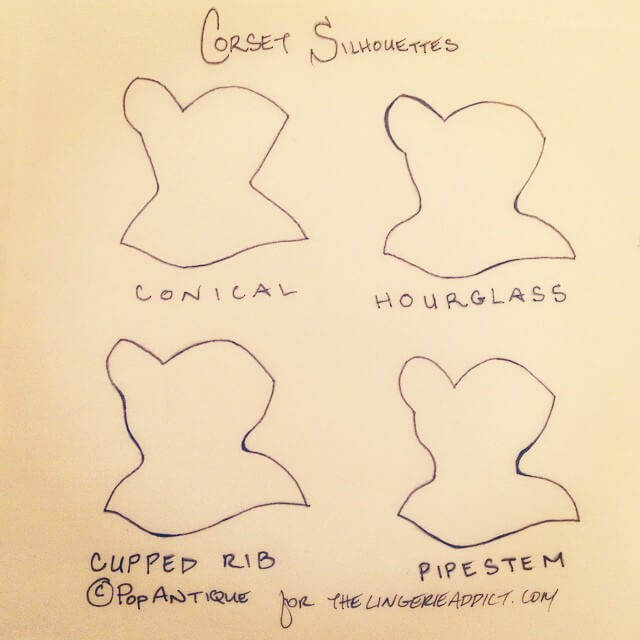 Budget corsets are often U-Shaped but make big claims about waist reductions (sometimes based on the number of steels they use), whereas a fine corsetiere could use the U-shape as a basis for a textural piece or to satisfy a client who likes the idea of a corset but wants very light compression and shaping. What is a wasp waist anyway? 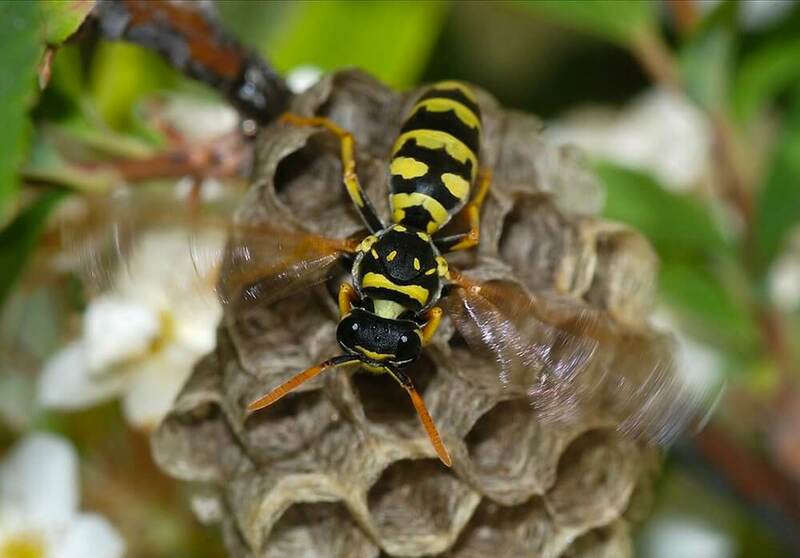 Anterior view of wasp. Photo via Wikimedia Commons. A "wasp waist" has become a very muddied concept, meaning different things to different people, and thus it is probably best avoided. Personally, I had previously considered it a more extreme version of an hourglass, with a sharply nipped and extremely defined waist. A variation of this is to consider a wasp waist and cupped rib as the same. Some think of it as falling on the other side of hourglass, between hourglass and conical... or a conical rib with a full hourglass hip. Is it also partially a matter of proportion, more so than shape alone. Suffice to say, a wasp waist means something different depending on whom you speak to, even amongst corsetry experts. I would caution against using this description when communicating with corsetieres about shape unless you provide accompanying images. Vanyanís Alecto underbust corset featuring smooth waist shaping. Modeled by Vanyanís designer, Lowana O'Shea. Generally speaking, the above silhouettes primarily describe the rib cage. The hip shaping is somewhat variable and interchangeable between styles, as with conical and hourglass ribs/hips in any combination. The degree of waist definition can also vary... an hourglass corset can feature a languid or dramatically nipped waist and still be an hourglass. Generally speaking, the more panels a corset has, the smoother and subtler any of these shapes tend to be, as the degree of change is split amongst many seams rather than forced into just two or three key seams. While it is possible to sculpt and pad to create a desired silhouette on any individual body (mostly), each person will have a corset style that is literally a better fit for the natural shape of their anatomy. Corset silhouettes, illustrated by Pop Antique. Conical, hourglass, cupped rib, and pipestem. Which is your favorite corset silhouette? does anyone know where to find a open rib style corset :/ ???? I love all silhouettes equally! I prefer the conical silhouette as well. It is the best fit for me, since my ribcage is naturally V-shaped. I also prefer a conical or smooth hip flare as I don’t have much “upper hip” so to speak; most of my hips are in the bum/thigh area where a corset doesn’t usually cover. So overall I look for a corset that mirrors my natural figure and enhances it. That is the most comfortable for me. I like the conical silhouette best – so delicate and slimming, or something between conical and hourglass – like the signature Puimond corset shape. It gently compresses the ribs and looks conical at sides, with a slight dip just at the waist. At the same time it cups the ribs at the front and is incredibly comfortable, with a good reduction.